Before I started planning this trip, most of what I knew about Route 66 I learned from the song. Lucky for me and the Hamster, my years in journalism taught me how to become an expert in almost anything very quickly. Even so, doing a few hours of research and having read The Grapes of Wrath once and watched the movie Cars on DVD with my kids a couple of times prepared me only partially for this trip. However, after spending today traveling down approximately one-eighth of Main Street, USA, my research did help me put what I saw in context and gave me a better understanding of the meaning of the Mother Road. 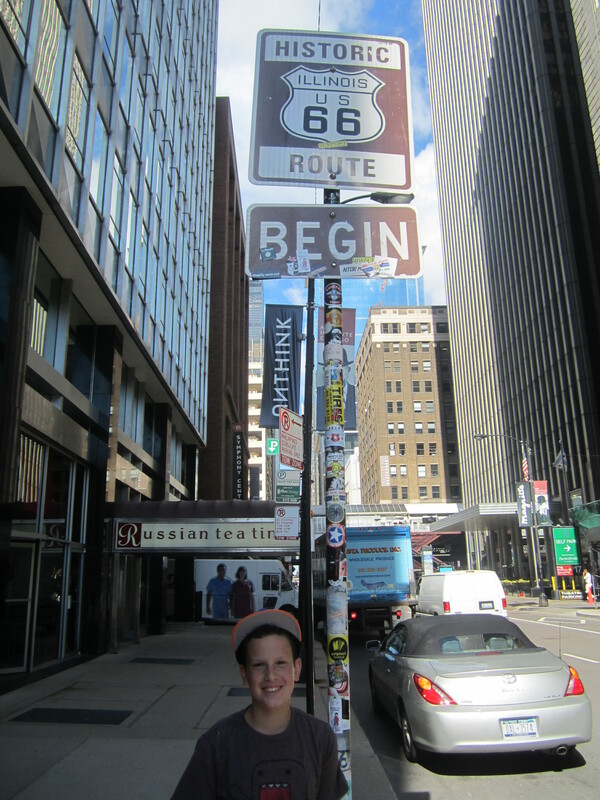 We started early this morning at ground zero—a street sign in downtown Chicago that marks the beginning of Route 66. 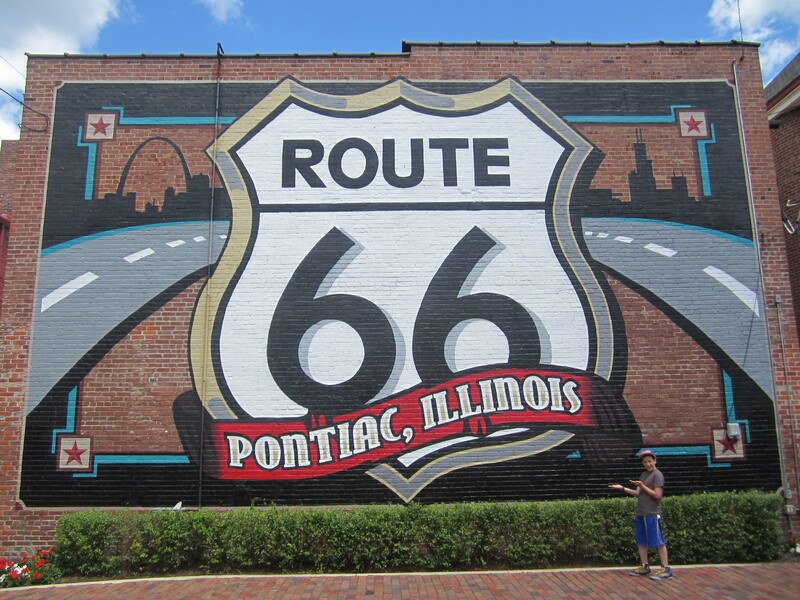 Eventually we found ourselves in Pontiac, IL, which is an adorable town that’s pretty obsessed with Route 66. It boasts the largest Route 66 shield, which is part of the big mural pictured at the top of this post. It’s painted on the back of the building that houses the Route 66 Hall of Fame and Museum. Oddly, there are several Route 66 Halls of Fame and/or Museums throughout the road’s eight states, and I assume they’re all pretty much like the one in Pontiac: small, cute, well-meaning, and not all that interesting. 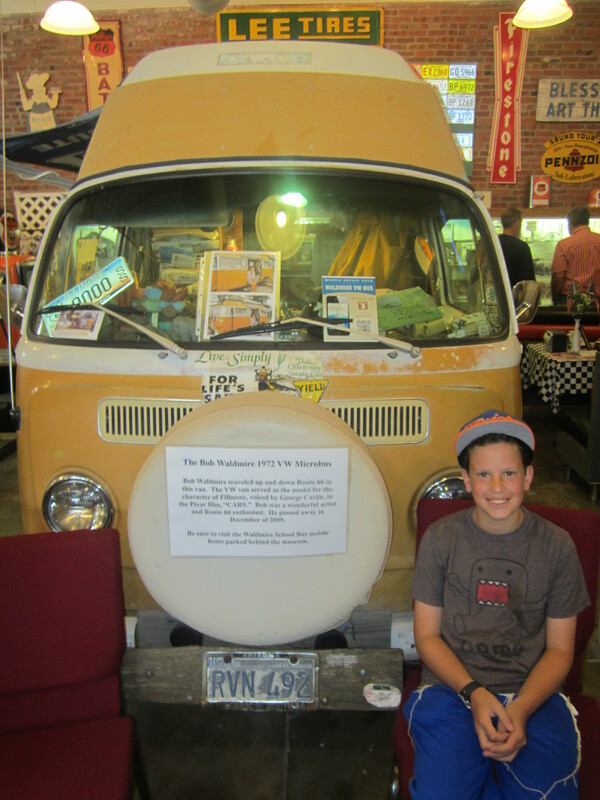 By far the best part of the museum was the VW minibus whose owner drove it across Route 66 repeatedly, and which served as the inspiration for the character Fillmore in Cars. 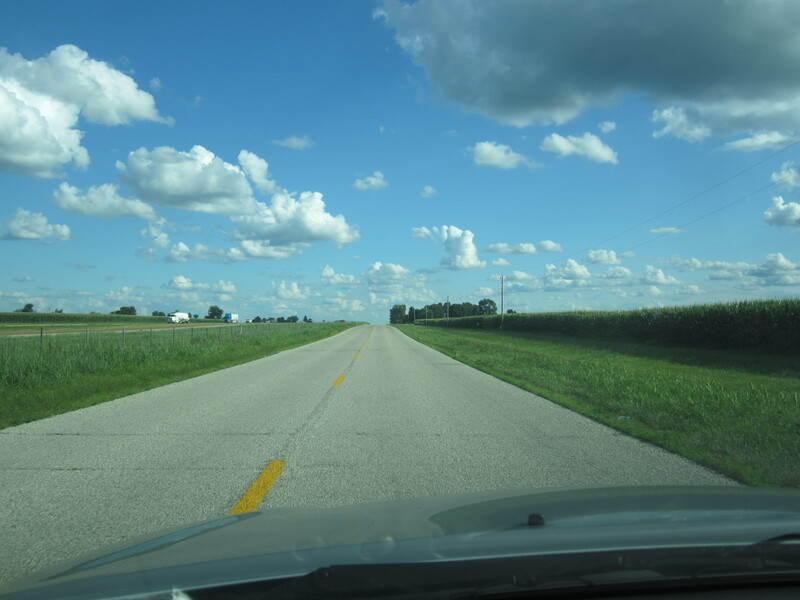 As we followed the road out of Pontiac toward Springfield, my research, my experience, and Cars all came together and suddenly I understood the whole story of the road, but particularly the newest chapter in that story. In the ’60s, chunks of Route 66 started getting bypassed by Eisenhower’s Interstate Highway system. In 1970 the last piece of Route 66 was bypassed by an Interstate, and the newly obsolete road was officially decommissioned. Route 66 no longer exists on highway maps—stretches of it are called Old Route 66, but most of it has been renamed entirely, names like Main Street or Frontage Road or whatever. Sometimes the road turns when it goes through a town, and it suddenly has a new name, and staying on it requires paying close attention to the little “Historic Route 66” markers that appear on the shoulder every so often. The Interstates are bigger, straighter, and faster. But one of the reasons that they’re faster is that they go around towns instead of through them. For most of Illinois, Route 66 runs right alongside I-55. I mean they literally run parallel, maybe 20 or 30 feet away from each other with nothing but a strip of grass separating them. This is Route 66. I-55 is on the left. Corn is on the right. Yes, the Interstate is paved a little better and is a little wider and has a higher speed limit (70 mph vs. 55), but otherwise there’s not much separating them, both literally and figuratively. For the most part, they only veer away from each other physically at exits, which is exactly what makes them so different, and it’s exactly what they were talking about in Cars. Route 66 goes right through every town, sometimes just a few feet away from people’s houses, and often right past the stores and restaurants and motels that sprung up to service the drivers as they passed through. You don’t even have to leave the road to patronize most of these businesses. The Interstate bypasses the towns completely, forcing you to get completely off the highway at an exit in order to stop anywhere. This cuts down on travel time considerably, because there are no stop signs, no traffic lights, and no turns. But there’s also nobody stopping at all those roadside businesses because they’re no longer roadside, and many of them have gone out of business. The ones that survive do so based on nostalgia tourism (mostly by baby boomers) and as relics from a past to which fewer and fewer Americans can connect. When the last generation to travel the road in its heyday dies out, so too, will those remaining businesses and perhaps even some of the towns. 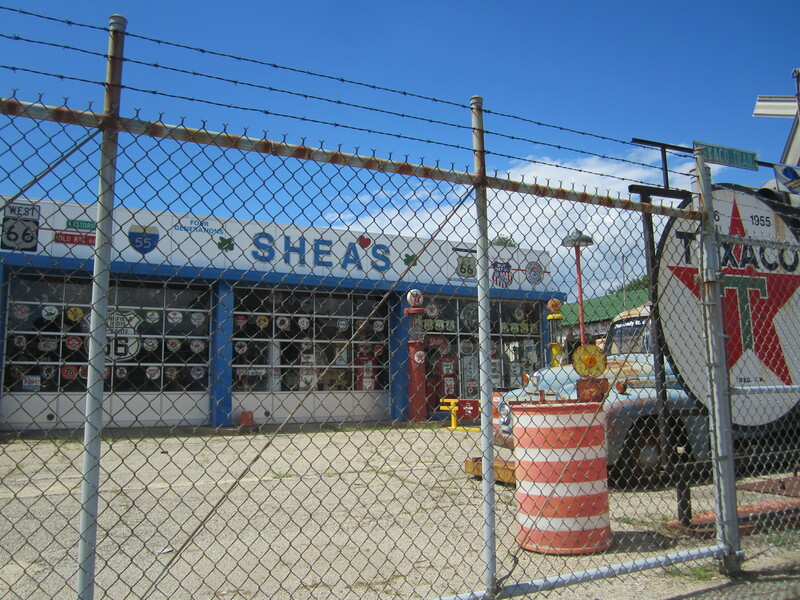 Exhibit A in this slow death is Shea’s Gas Station in Springfield, IL, a Route 66 icon that exists now more as a kitchy curiosity than as a legitimate business. In fact, when we arrived at 2:30 pm, it was closed. I read in an online review somewhere that it opens by appointment only, though I’m not sure how accurate that information is. Either way, we stopped, snapped a couple of photos, and moved on, which is just about all happens at many Route 66 attractions nowadays. On the bright side, the rest of Springfield was wonderful. I have long had something of an obsession with Abraham Lincoln, and there’s no better place to feed that obsession than the city that calls itself “Land of Lincoln.” Abe wasn’t born in Springfield and he didn’t die in Springfield, but he lived there for the 25 years leading up to his election, and it’s where he was laid to rest. 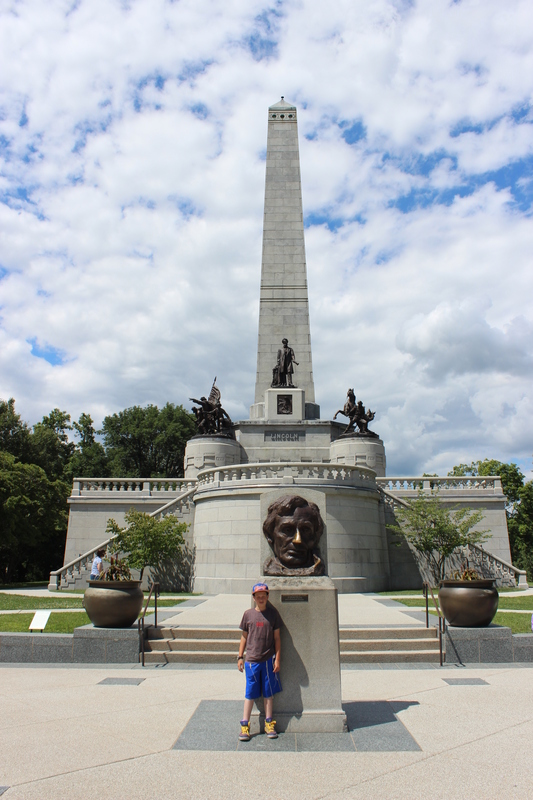 In fact, Lincoln’s tomb is the first thing we visited. It’s massive—a huge granite structure 117 feet tall that you can see before you even enter the cemetery. Next on my list was the Lincoln Presidential Library and Museum, but Sam nixed it, understandably. 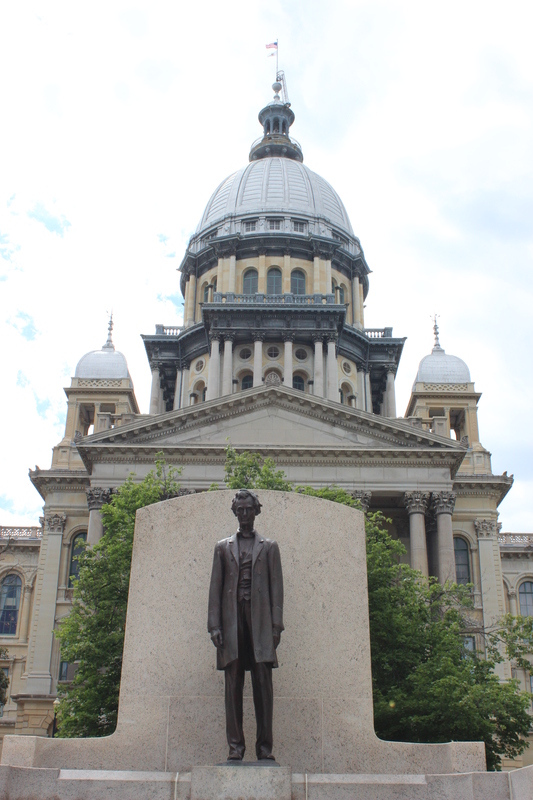 So instead we headed to the State Capitol, which, like Lincoln’s tomb, is both enormous and stunning. 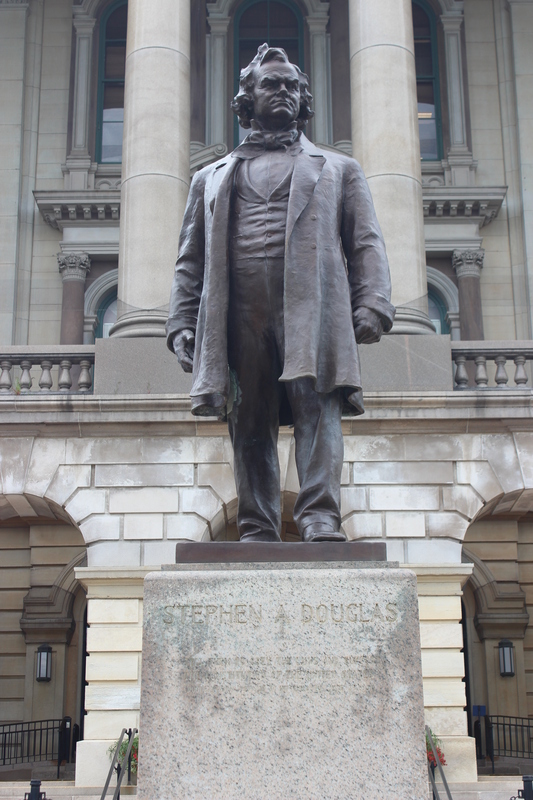 There’s a cool statue of Lincoln in front, of course, which hides an impressive statue of Stephen Douglas, an appropriate placement if there ever was one. 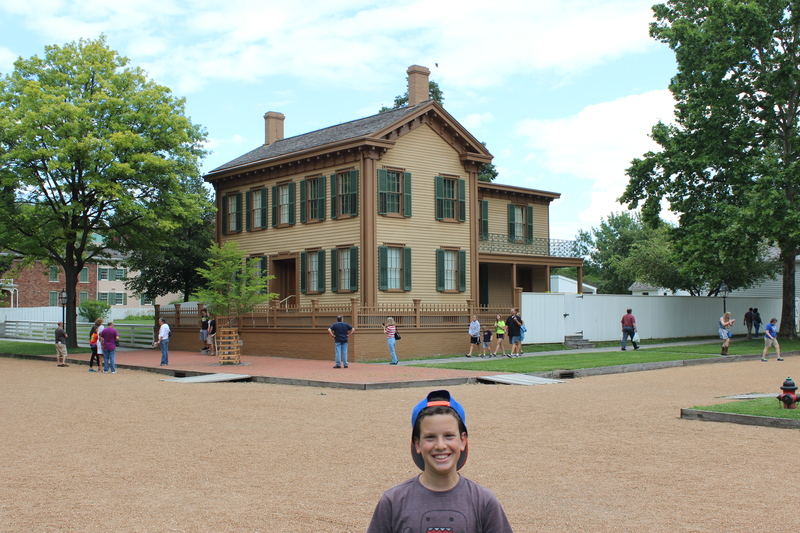 Lincoln’s first law office is not far from the Capitol, but Sam wanted to skip it in favor of Lincoln’s house, which is a National Historic Site and thus has a robust visitors center staffed by National Parks Service rangers. We got to the house in time for the 4:00 tour, but the free guided tours sell out for the day early each morning, and cannot be reserved online or more than a few hours in advance, so we had no chance. Unfortunately that meant that we couldn’t go inside the house, but we could still walk right up to it and admire the outside. In fact, the National Parks Service has preserved a mini neighborhood–a few blocks in each direction, with Lincoln’s house in the center. So we were able to walk around and even to go inside some of Lincoln’s neighbors’ homes. 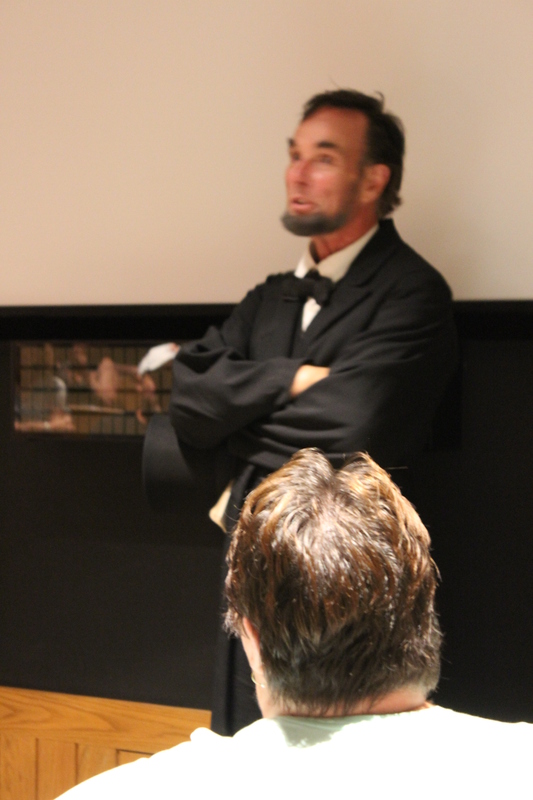 We also got to sit in on a talk given in character by an actor dressed as Lincoln. “Abe” had just been elected President and discussed his experiences in Springfield and his thoughts about leaving. I thought it was going to be cheesy but it was actually very well done and provided an interesting view of Lincoln as a man, a husband, a father, and a neighbor rather than as a politician. At that point we left the Land of Lincoln for the land of nostalgia. Taking Route 66 toward St. Louis, we made our final stop of the day at a Route 66 attraction that is everything that roadside attractions aim to be: quirky, unique, sweet, and fun. Henry’s Rabbit Ranch hasn’t been around quite as long as some of the attractions from the ’50s, but it’s got more heart than most of them. Despite the name it’s not a rabbit ranch, exactly, but it is home to more than a dozen or so rabbits, all of which are rescue rabbits. It is also home to at least a dozen Volkswagen Rabbits, some of which are half-buried in the front yard in a row. The ranch closes at 4 but Henry himself was still there and happily let us in to pet the bunnies and look around. 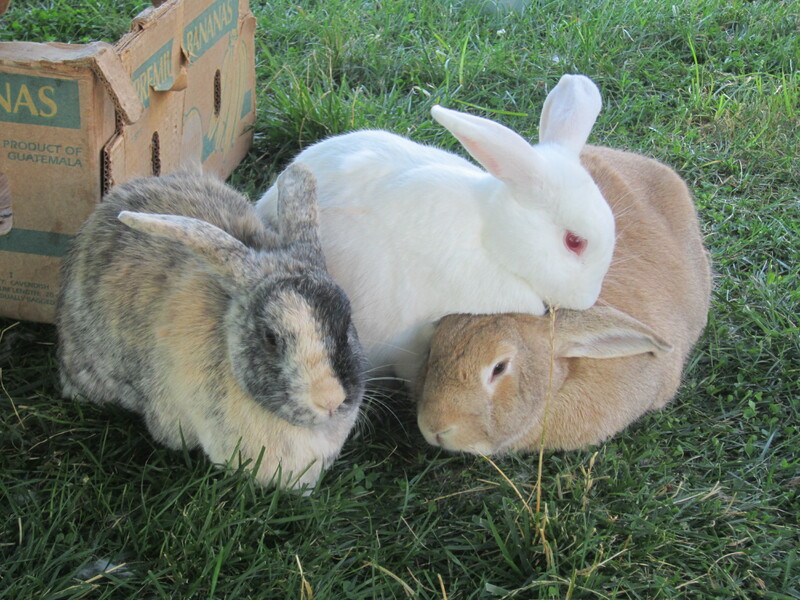 Having recently become bunny owners ourselves, Sam and I had a great time meeting all the rabbits and chatting with Henry about all their back stories. 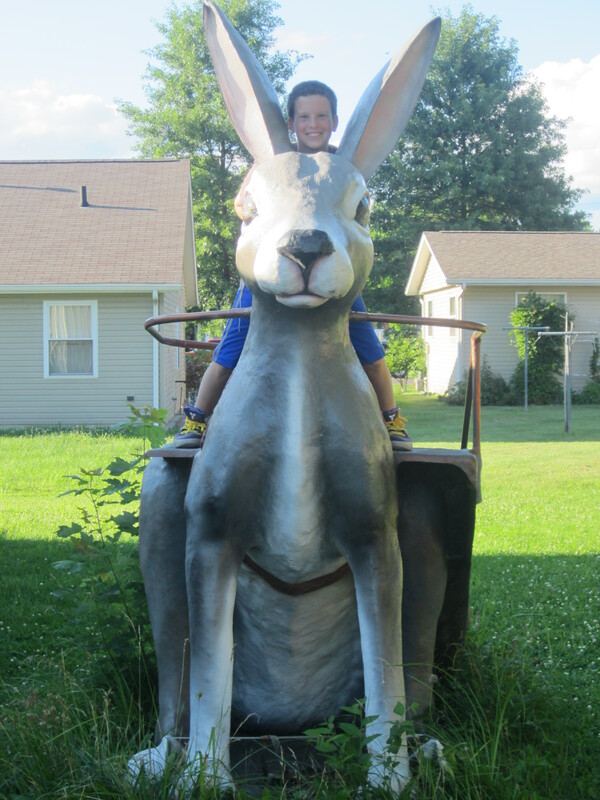 And of course we couldn’t miss climbing on the 8-foot-tall rabbit and soaking up all the other Route 66 kitch scattered around the ranch. 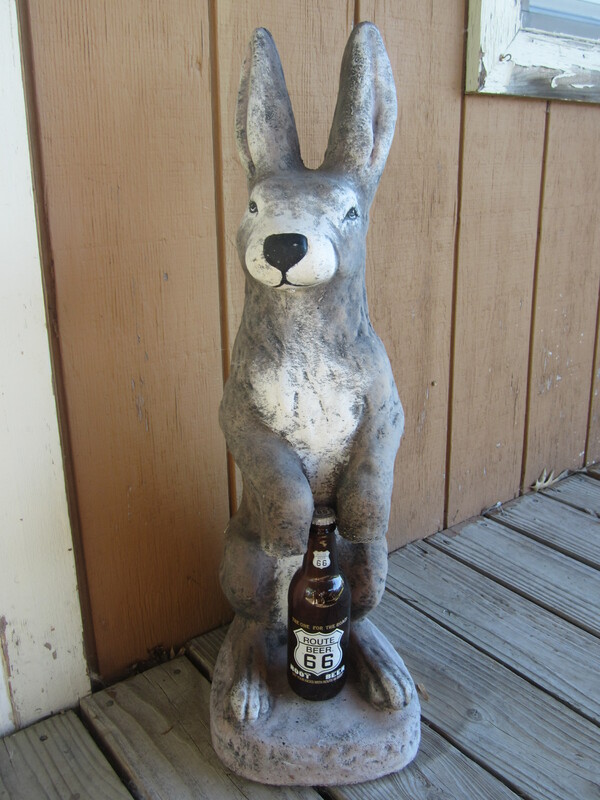 The rabbit statue is holding a route beer. Get it? “Route” beer! 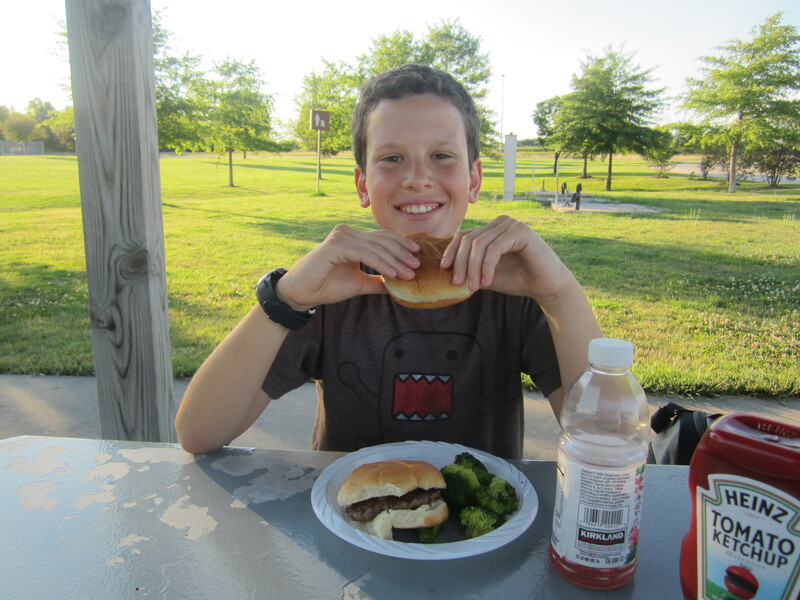 Henry was even nice enough to point us to a pretty nice highway rest stop that wasn’t too far away, where we had our first roadside cookout of the trip: burgers and broccoli. After dinner we continued toward St. Louis but decided to stop short of the Missouri border and we pulled up for the night at a surprisingly nice Super 8 in Troy, IL. It’s not actually nice, mind you, but it’s much nicer than anyone has a right to expect from a Super 8: a pool, an elevator, decent-size rooms, and a very friendly front desk staff, all for just $65. In fact, we were settled for the night so early in comparison to the past couple of days that we jumped into the pool for about half an hour before I dragged Sam out of the water and off to bed. 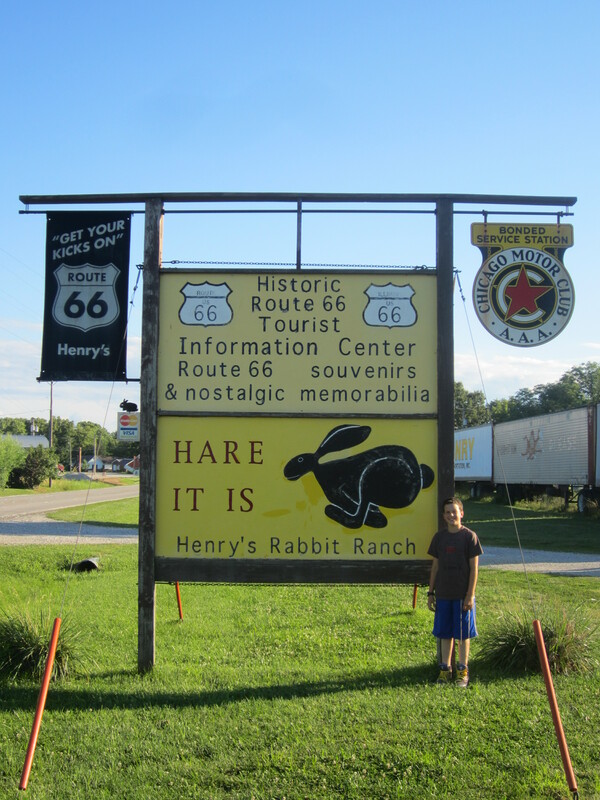 As he got into bed, he talked about how great the day was, how soft the bunnies were, and how cool it was that, after two days on the road, we had finally gotten some actual kicks on Route 66.